I was at Trailheadathon event on this Saturday, 10th Sept'16 in Gurgaon. From meet-up standpoint it was good, but something else was very unique about it, i.e. Salesforce sponsored 3 college students (Maneesha Kandala, Subhashini, & Sri Ramya Pratha) to fly for this event, from Vizianagaram to Gurgaon. These students were from MVGR College of Engineering, Vizianagaram, India. Mr. Satya Reddy UNIX professor from the same college, joined them as well. 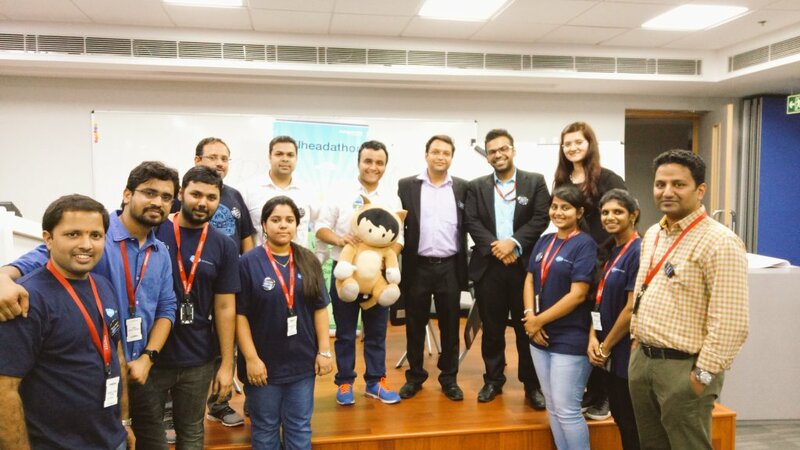 Its quite interesting that despite of being a UNIX expert and teacher himself, he is quite excited about Salesforce, and he was one of the driving force, which pulled up students to achieve this kind of milestone. Naga Kiran from Salesforce India Developer relations team, visited their college nearly a month before Trailheadathon, and conducted a two days workshop with his team of 21 guys. After that workshop from Salesforce, it was enthusiasm of these college students, which made them work together as a team after college hours. They compromised their fun and sleep time, and spent the same after studies to learn Salesforce on their own (via Trailhead). Maneesha Kandala a student from same college, completed all 4 super badges and 100 badges in a month. This college now has a 100 badges club, aka Century Club for Trailhead badges. Women power from college i.e. Likitha, Subhashini, Ravali, and Sri Ramya are proud members of this club. I was very excited by all this, and can't resist shooting a video interview with these bright students. I hope this video and post will motivate young developers, freshers and students everywhere to step up there game and start learning Salesforce. I am a developer at heart, and taking videos/interviews is not best of my skill. Motivation was to bring and highlight this awesome success story with the world. Please excuse and video/audio issues in above youtube embed. Atul Gupta for organising this event, he is very regular in making sure we have good meet-ups in Gurgaon. Nagarro: For sharing the office space, and other logistics. Thanks to Mr. Viyom and his team for all the support. How to make most out of Salesforce Meet-ups ? How our team masters Salesforce using Trailhead ?